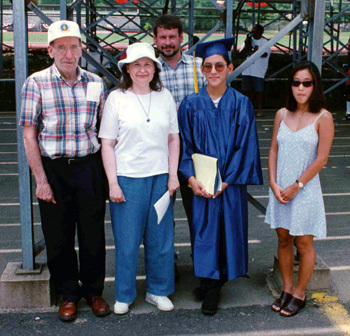 June 13, 1996 was Graduation Day at T.C. Williams High School, in the halcyon days when its poor academic record was a local secret, without the government-mandated stamp of fail affixed to it. T.C. was never actually as bad as reported, although it's true that you were either destined for MIT or McDonald's from day one, and the word, "halcyon", didn't appear in the colloquial dialect unless you were an SAT taker in the top-half of the college-bound. For further proof of selectively high academic standards, consider the snapshot below of Straight A procession. By tradition, anyone with a perfect 4.0 average led the graduation procession, and this year's class had 22 students within a few hundredths of a 4.22 (mainly because of the retarded 0.5 extra credit you could get for A.P. courses). Because nerds are very likely to get up in arms if they feel cheated out of grade recognition, it was decided that the 22 students would walk across the crater-pocked football field of glory in alphabetical order. So in front of me is Steve Seltz (Brown), to my right is Mike Stafford (Yale), and behind me is Jack Wilmer (Princeton). Not pictured are the large percentage of the 454-person graduating class that answered "work" or "undecided" on their post-graduation survey, or the slightly smaller percentage that could not read the survey because their teachers were too busy showing "Home Alone" in the classroom to teach literacy. I probably went to more parties in Graduation Week than I did in the first four years of my college career (because frontloading is a valid and successful strategy for life). On the 12th, we all had to attend the Graduation Rehearsal, which is very similar in spirit to a Wedding Rehearsal except that fewer people care about it. After rehearsal, I went to the graduation party of my friend, Rupa, who lived deep in Hybla Valley but got into our school by virtue of having a teacher for a dad. After the expectedly underwhelming ceremony in which the valedictorian invoked Star Wars and the salutatorian made analogies about Superman, my parents held a graduation party with my uncle and grandpa, as well as Henry and Felipe, who I grew up with in the very, very early years. 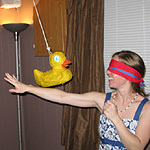 I then drove across town to Hilda Dundon's graduation party, and ended up missing Mike Buns' party by a hair. That was okay though, because I needed to rest up for the All-Night Grad Party. It was your typical mix of fake gambling, sumo wrestler suits, velcro walls, and the game where you run as hard as you can before a bungee cord whips you back and teaches you about elastic momentum. That evening, I earned $10,000 in fake money, as well as a clock radio which eventually ended up with Anna's mom at their annual Yankee Swap in December 2001. I slept until eleven the next day (because even in my youth, I rarely slept late) and then attended Ben Seggerson's pool party in Windgate. I remember very little about this party except that there was a poorly timed thunderstorm and that Ben had a hot cousin. The FOLLOWING day, the events were repeated, except at Jack's pool instead of Ben's pool. The URI! family did not have a pool, but we did rock out in the sprinkler on occasion.